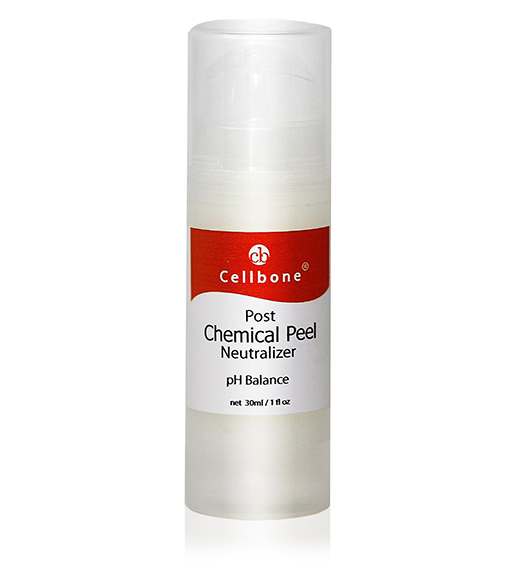 Post Chemical Peel Neutralizer Cream ends the peeling process and helps your skin get its optimal pH balance back again following Glycolic Acid Peel, Lactic Acid Peel, Mandelic Acid Peel, and the G/L TCA Peel. Active ingredients helps soothing the skin and aid in the healing process. Post Chemical Peel Neutralizer Cream ends the peeling process and helps your skin get its optimal pH balance back again following any chemical peel. Chemical peels can give your skin a whole new lease on life -- but many people worry about the aftereffects of the peel. Fortunately, the Cellbone peels, including Glycolic Acid Peels, Lactic Acid Peels, Mandelic Acid Peels, and the G/L TCA Peel, are specially formulated to be both incredibly powerful and as gentle as possible for your skin. If you want to help your skin recover as quickly and easily as possible, regardless of the peel type, the Post Chemical Peel Neutralizer Cream may be ideal. This product ends the peeling process and helps your skin get its optimal pH balance back again following any chemical peel. Apply the cream generously onto the area where peel product was applied. The cream will actively neutralize the skin for 60 seconds. Wash off with cool water. Follow with Cellbone Neturalizer or Hydra CP+ Gel. Avoid direct contact with eyes. For external use only.